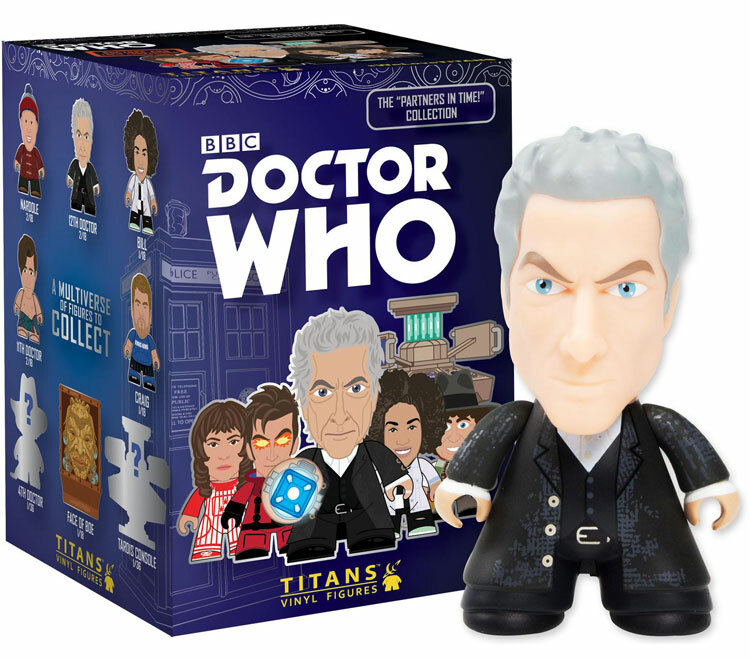 From Titan Entertainment comes the next, much-anticipated wave of our 3″ blind-boxed Doctor Who TITANS! 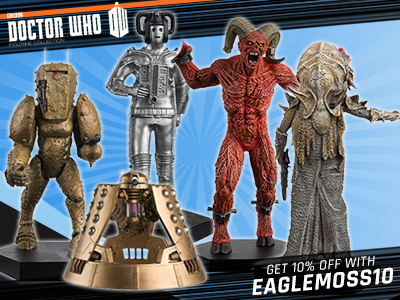 The “Partners in Time” Collection celebrates some of the Doctor’s most popular friends & companions from across time and space. 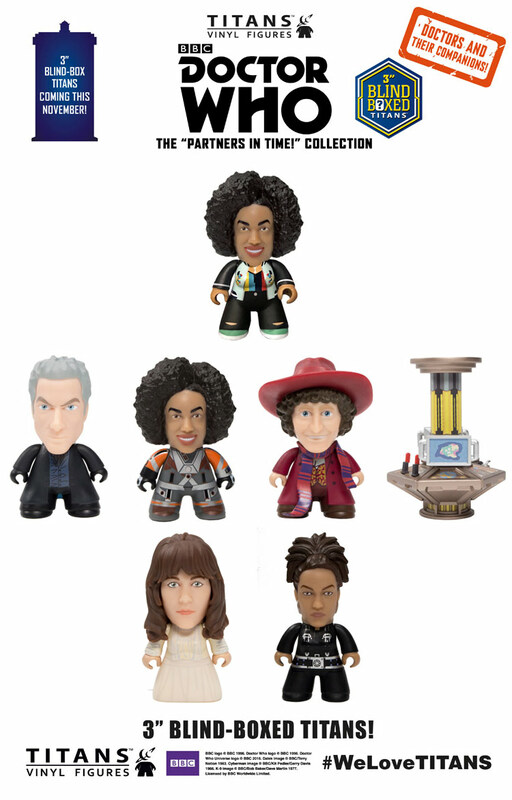 Featured within the range are the 4th Doctor with his much-requested classic companion Sarah Jane Smith, the 10th Doctor joined by the much-requested Martha Jones and Donna Noble, the 11th Doctor and his sometimes-flatmate Craig and the 12th Doctor with his sparky new companion Bill Potts! 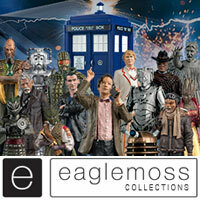 As a special treat, we’ve also included the mysterious Face of Boe and the 3″ TITANS vinyl version of the TARDIS console! I removed Clara (Robot of Sherwood version) from my shelf as it could be any cheapo toy, but Sarah and Nardole’s faces are realistic, very different to the cartoonish Clara. It does seem more an image of Matt Lucas rather than his fictional counterpart Nardole but I hope future waves continue this facial realism. I’d like to see a Classic range but I suppose it wouldn’t sell enough. I have to say these look terrible now – I had every single one up to a year ago, can’t even be bothered to buy any of these – although if I see a cheapy tardis console I might buy one. 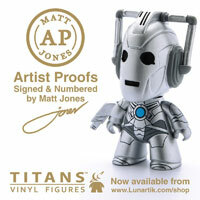 I think I might ask Matt if he’s still designing them as I can’t believe he would put his name to these! They look just the same to me too. Can’t see the problem. Why is the Hot Topic Bill the one with Bill’s main outfit and not the regular version. Stupid. Are you going to the toy fair tommorow ??? 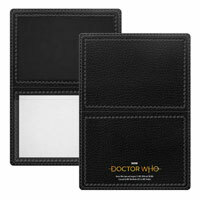 And will the doctor who merchandise be revealed tommorow ?? It should be UK first as it’s a UK show. because without the USA market these wouldn’t exist at all, same with the Bill exclusive hot topic sell bucket loads of these. Then why not let it be in the UK after US? It’s a rhetorical question really, but I wonder how many “enough” actually is? I never see them in shops in the UK. But they have other Titans figures. Does anyone have an image of the rare hot topic bill titan ??? Do we know it will become available in the UK at all? No, it won’t be available in the UK. It’s a Hot Topic Exclusive. The one’s that did turn up here were the 10th. Doctor Injured & the 10th. Doctor Hawaiian. The Silver Tardis was a separate issue. Even Hot Topic have now got wise to their Exclusive’s & now no longer put a sticker on the box. 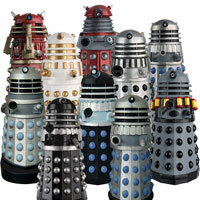 Which is one per case & replace’s one of the Sarah Jane Smith figures. 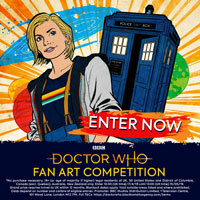 What costume is the chase 12th Doctor wearing? It’s Thin Ice, just without the top hat. I have some to trade if anyone is interested? I’m surprised TITANS haven’t announced their next wave yet. May be a bit too early since they are just hitting the shelves this week, but London Toy Fair is around the corner (late January) and New York Toy Fair is in February, so we may see an announcement around then! 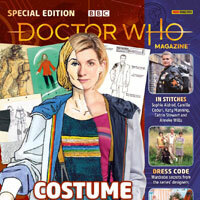 SUPER RARE – Sarah Jane: Pyramids of Mars white dress. ULTRA RARE – Martha Jones: Black suit from The Stolen Earth. 1 in 200 and 1 in 300 unlikely you will find them without shelling out loads of money. From a highly reliable eBay seller. Ah. I may have already said more than I should. I didn’t know it was a “secret”. Nor have I seen any pictures. Really dodged a bullet here in not getting a set! 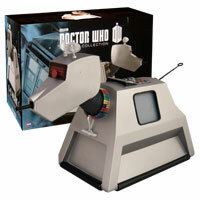 It’d be handy for figure collectors to use if they made an upscaled version of the TARDIS console “figure”. Also, are they forgetting to make these stylized? Seems like the new sculpts for heads are more realistically detailed (compared to the old Tenth/Eleventh Doc sculpts also on show here), and I dunno if that’s the best approach here. The two boxes I ordered arrived today 🙂 But I got two of the same Fourth Doctor, they do look good though. Forbidden Planet? If so i might grab some soon! Now put back to Jan 9th. 2018. Just cancelled both my cases from FP. Seriously?? !…just in time for xmas….2018. The Chase for Bill I the space outfit if you look onto the interactive collectors list…. Who knows if there is going to be a bill Potts figure being released in time for Christmas ???? 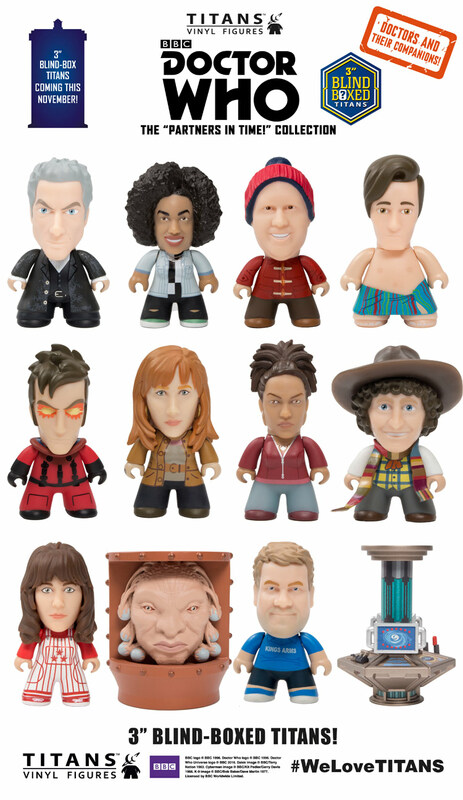 They should of done a small wave of figures based on Series 10 back in June/July time. 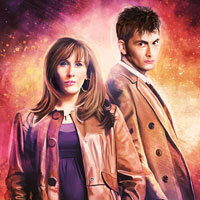 Hope we get a modern version of Sarah Jane too. Slightly off topic,but has there ever been any talk of a Blake’s 7 series in the Titans range?..same era as classic Who,similar fan base. Isn’t there a reasonably big Blake’s 7 (or classic Who come to that) fan base outside of America?..i’m sure there are collector’s of these figures worldwide,why does it all have to revolve around the US market? & if it get’s put back again from December, I’m cancelling my case! I can understand a few days leeway but 7 weeks? !…these would make great xmas presents but I was hoping it would be this xmas not 2018. That’s very amateurish if true. Rare Bill might be from thin ice …. 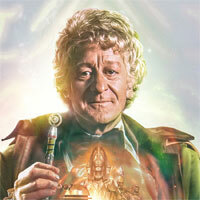 Does 4th Doctor come with a sonic? Yet another new series of these things, and i still havent brought one of ANY series. Ill admit that i have liked the design of some of them over the waves that have been released. However, i personally cannot justify them due to the fact that for example if you buy 2 or more then its a possibility that you could end up with repeats. But each to their own. Ill just live in hope that more 5 inch figures will be released in the future, would really like to get the 13th Doctor if she gets made. Then just buy the ones you want on eBay. Simples. I’m guessing those are the variants.